The Miserable Rich were not only one of Brighton’s most-loved bands but seemed to have a Pied Piper effect on any city they performed in around the world. They bowed out gracefully in 2012 but have reformed for a very special one-off concert in aid of the Kit Tarka Foundation, established by vocalist James De Malplaquet and his partner Sarah following the tragic death of their son, Kit, at only 13 days old from HSV1, the same virus which causes cold sores in adults. 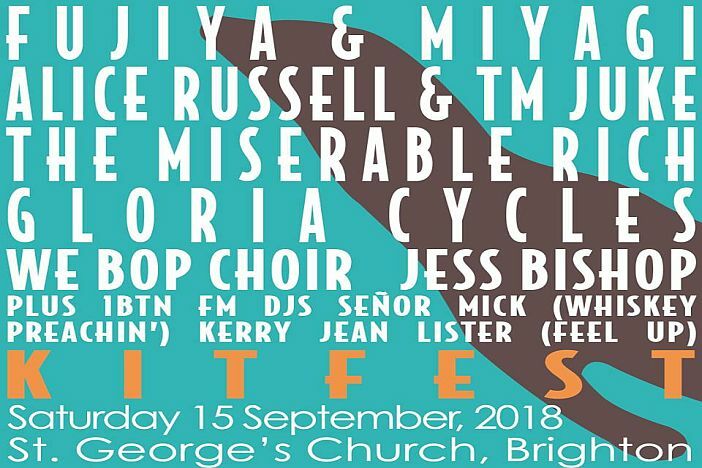 A sterling line-up of big Brighton names, including several SOURCE cover stars from the print days, has been assembled in support of this special event at the beautiful St.Georges Church in Kemp Town. The We Bop Choir will begin proceedings followed by Jess Bishop’s alt-folk blues and Gloria Cycles returning to perform their first show in eight years. The Miserable Rich have placed themselves midway through the evening for their first gig in four years, after which Alice Russell will be performing a rare acoustic set with TM Juke which will be their only show this year. Fujiya & Miyagi’s industrial electro-pop will bring the evening to a close with what will be their only Brighton show of the year. Throughout the evening, 1BTN’s Senor Mick (Whiskey Preachin’) and Kerry Jean Lister (Feel Up) will be DJing between sets plus there will be food, a raffle and this year’s Brighton Festival guest curator David Shrigley will be MCing to keep things in order. This is an incredible line-up performing in support of a hugely important cause in one of Brighton’s most beautiful venues that promises to be a night to remember. St. George’s Church, Saturday 15th September 2018. 3:30pm – 10:30pm. £18 unreserved admission plus optional suggested donation of £10 per ticket.